Our Community Concert Series runs from September to June every year. 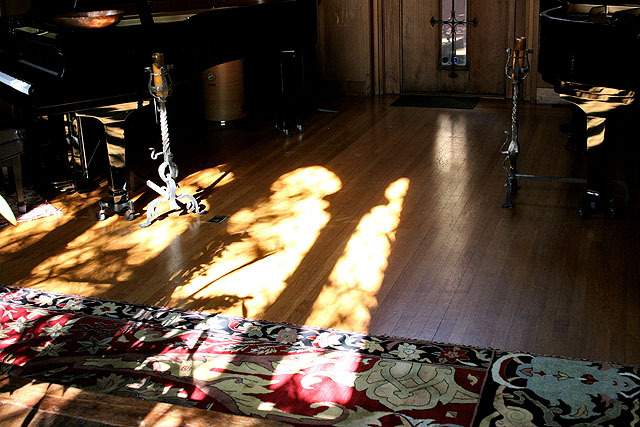 We are dark during the summer months of July and August during which time the Maybeck Studio is closed. Please note: we are currently completely booked for the 2016-2017 season. The 2017-2018 Season begins September, 2017. Concerts are held on Sundays at 3pm, if you would like to perform here, contact us with links to your music and a brief description about your performance. The audience space can hold up to 40 people. Larger ensembles tend to squeeze the audience still further. You’re welcome to take donations at the door, if you have somebody to work the front of the house. In that case however we’d like to ask for a $150 donation to the maintenance fund. We’d waive that for free concerts. There is a good Yamaha grand piano in the space. We encourage you to attend a performance in the space to get a feel for the layout and acoustics. It's your responsibility to fill the hall. We have a neighborhood mailing list we use, but you'll need to promote the performance among your local contacts.